MCE Internal Blu-ray Recordable Drive for Unibody MacBook Pro 13", 15", and 17"
It's finally here! 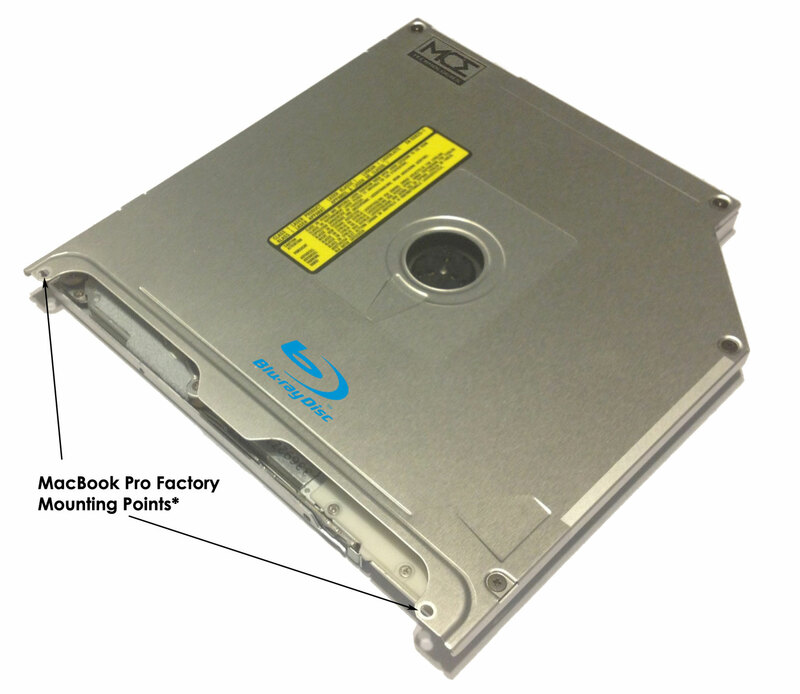 Introducing the MCE Internal Blu-ray Recordable Drive for MacBook Pro! Available exclusively from MCE! Our new Blu-ray Player/Recorder + 8X Dual-Layer SuperDrive for Unibody MacBook Pro is a direct replacement for the original 8X SuperDrive that shipped with your machine and installs into your MacBook Pro in precisely the same manner to ensure stability and slot-alignment. The drive is Mac OS X 10.5 through 10.12 (Sierra) compatible and plays commercial Blu-ray movies right on your MacBook Pro with the included Mac Blu-ray Player Software! And because it burns Blu-ray discs too you can author High Definition Blu-ray Movies directly to 25GB, 50GB, BD-R and BD-RE discs and burn data to up to 100GB BD-XL TL discs! Installation is a breeze as we include an illustrated installation guide and all the tools you need to successfully install the drive into your machine. Once installed it will perform exactly like your original SuperDrive... except now with the ability to play Blu-ray movies and burn Blu-ray discs! It is bootable and can be used to install system software and applications as well as play and record all types of CD, DVD, and Blu-ray formats and media. Watch visually-stunning commercial High Definition Blu-ray movies right on your MacBook Pro with the included Mac Blu-ray Player software! Write to 25GB and 50GB BD-R and BD-RE media, and even up to 100GB onto a single triple-layer Blu-ray BD-XL TL disc! All-in-one BD-R/RE, DVD-R/RW, DVD+R/RW and CD-R/RW recorder designed to offer the widest possible playback compatibility. Record to Blu-ray (BD) media at up to 6x speed, DVD media at up to 8x speed and to CD media at up to 24x speed. *The MCE Blu-ray Recorder/Player for MacBook Pro Unibody installs using the same mounting points as the original SuperDrive to ensure proper stability and slot-alignment... an MCE Exclusive. Important Note: The drive listed on this page is only for use with Unibody MacBook Pro Systems, and is not compatible with pre-unibody MacBook or MacBook Pro systems. If your Apple laptop is silver, says "MacBook Pro" or "MacBook" at the bottom of the screen AND it has a black keyboard then this drive is compatible with your machine! See below for complete compatibility information. *The MCE Blu-ray Recorder/Player listed on this page is compatible with all unibody MacBook Pros and unibody MacBooks (except the MacBook Pro with Retina display). Use this guide to compare the Model Identifier of your machine with those listed below. Finding your Mac's Model Identifier is easy: Simply hold down the Option key on your keyboard and click on the Apple icon at the upper left of your screen. Now select the first item there which will be either "System Information..." (Mac OS 10.7 - 10.12) or "System Profiler..." (Mac OS 10.6 or earlier). The next window that appears will display your Model Identifier near the top. If your MacBook Pro or MacBook has one of the Model Identifiers listed below then it is fully compatible with the MCE Blu-ray Recorder/Player listed on this page. Unibody MacBook 13-inch, MacBook Pro 13-inch, MacBook Pro 15-inch, or MacBook Pro 17-inch; Mac OS 10.6 through Mac OS 10.12 (Sierra); 2.0GHz or faster processor and 4GB RAM or more required for smooth playback of Blu-ray movies.